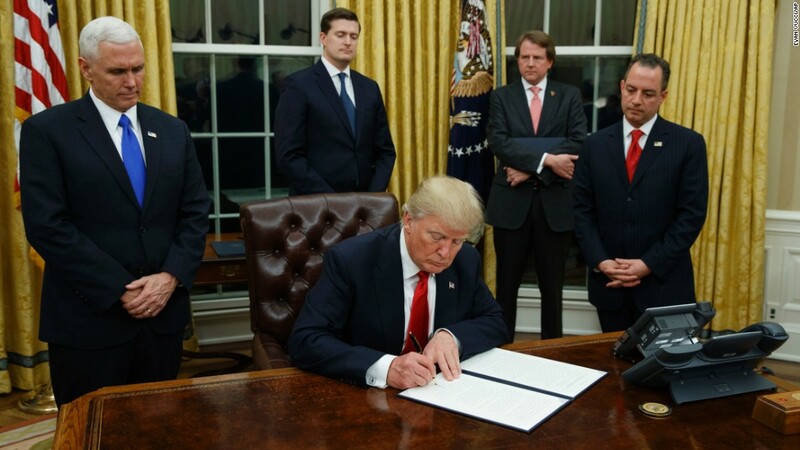 President Donald Trump and staff signing the Healthcare bill. The American Health Care Act, or AHCA, is a bill that was created by the United States Congress to repeal and replace the Affordable Care Act, or Obamacare. On May 4, 2017, the United States House of Representatives voted to pass the AHCA, and then sent the bill to the senate. The AHCA would increase the number of uninsured people by 23 million over the course of 10 years, but would also decrease the federal budget deficit by $119 billion over the same time period, mainly by cutting medicaid coverage for low-income Americans. The bill also states that premiums (an amount to be paid for an insurance policy) for younger, wealthier people would probably decrease, while premiums for older and poorer people would increase. What are Americans saying about this? Well, according to a CBS news poll that was taken between September 21 and 24, 52 percent of Americans disapprove of the AHCA. That’s around 162 million people. 20 percent of Americans supported the bill, and 28 percent of Americans were clueless as to what they thought about the bill. Also, major health groups united in opposition of the GOP bill, such as the American Medical Association, the American Hospital Association, America's Health Insurance Plans and the BlueCross BlueShield Association. Theresa Treece is among those worried that she’d have to gain more health insurance due to the GOP bill. She has rheumatoid arthritis, and feels that Obamacare covered most of her health insurance. “The GOP has not come up with anything better or cheaper. I don’t care what they say,” she says. Treece is a former Trump supporter, and now she doesn't know what the bill will do next. The AHCA is definitely different than any other health care bill the United States has ever seen, whether it is the BCRA or the ACA. Unlike the ACA, the AHCA will increase premiums for younger people, where the ACA had more premiums for older poorer people. It will continue the ACA rating rules, except age rating of 5:1 is permitted starting January 1, 2018, unless states adopt a different ratio. Hopefully it will keep Americans in good health for the four years the President Donald Trump is in office. What do you think of this new bill? A mock-up image of a Hyperloop. On October 3rd a Hyperloop between St. Louis and Kansas city was announced. The proposed Hyperloop could get you between the two cities in 30 minutes, where a trip by plane would take 55 mins and a trip by car would be 3 ½ hours. You might be asking what is a Hyperloop? A Hyperloop is a train levitating on magnets traveling through a vacuum at high speeds. This plan was originally suggested by Elon Musk. Elon Musk is a billionaire who made his fortune through web companies like Paypal. He’s now the CEO of companies such as SolarCity, Tesla, and SpaceX. Tesla makes self driving electric cars, a exciting field with the technology of the future. SpaceX is the first private space company and has the first landable rocket. SpaceX is also planning to send people to mars in the 2020’s. Even with Elon Musk’s stellar track record, many still remain doubtful that Elon’s plans will work. Although, Elon Musk recently announced that he had verbal permission to build a Hyperloop between D.C and New York. Musk also announced that they had brought a pod up to 200 mph in the test track. While that is nowhere near the goal of 700 mph, it's a good start. The project is going well but there are still many hurdles to face and only time will tell if they can jump them. Photo from Angie's Social Media Account. I’m sure by now we all know about the tragedy that happened in Las Vegas this past Sunday. If you don’t already, let me give you a little knowledge. At 10:08pm on Sunday at the Route 91 Harvest festival, a 64 year old white man named Stephen Paddock shot from the 32nd floor of the Mandalay Bay Resort and Casino into a crowd of 22,000 people. 58 victims were shot and more than 500 people were sped off to nearby hospitals. So now that you know some of the details, who were the victims in the Las Vegas massacre? Angie was training to be a nurse assistant. When attending the music festival, she was occupied by her highschool sweetheart, Ethan Sanchez. When shot, Gomez struggled to breath and Sanchez carried her to the nearest car to get her to the hospital, but it was too late. Another close person to Angie was her older sister Tawny Finn. "She was such a good baby. ... She'd barely ever cried but when she did, I'd sing to her and she'd put her ear up to my mouth and just stop crying. She was just so wonderful." Says Finn. Her family describes her as beautiful, caring, intelligent, selfless, and curious. Such a wonderful person gone at such a young age. Photo from Jordan's Social Media Account. Jordan was the picture perfect cowboy. A heavy duty mechanic, tattoo covered guy who loved the outdoors. He too was attending the Festival with his partner/girlfriend. But when he was down on the ground hanging on to whatever life he had left, instead of holding the hand of his girlfriend he was holding a complete strangers named Heather Gooze. Gooze was a working bartender at the concert, and when several men carried Jordan over to the bar, Gooze knelt down and grasp his hands in a show of comfort. She could only describe it as "I felt, like, a squeeze on my fingers and then I just felt the fingers go loose," After a few minutes of dead silence the phone rings and Gooze picks it up and finds it to be one of Mcildoon’s friends asking if he was ok. Gooze told them what had happened and ended up getting in contact with Mcildoon’s girlfriend (who was locked down in a nearby hotel) and his mother who was back in Canada. Feeling like Gooze needed to help in some way she promised them that she would stay with his body until authorities could take over. Gooze told CNN "I would like to think, if it was me, somebody wouldn't let me sit there alone." Photo from Christopher's Social Media Account. Roybal was a Navy veteran who served in Afghanistan. His mother, Debbie Allen, was the one to confirm his death via a post on Facebook. Heartbroken and devastated his mother wrote "Today is the saddest day of my life, my heart is broken in a billion pieces". Along with that a old Navy shipmate named Matthew Austin says "it breaks my heart and infuriates me that a veteran can come home from war unharmed and events like these occur. Shipmate, you were taken much [too] soon." Roybal wrote on FB in July, describing what is like to be shot at as "The anger stays, long after your friends have died, the lives you've taken are buried and your boots are placed neatly in a box in some storage unit. Still covered in the dirt you've refused to wash off for fear of forgetting the most raw emotions you as a human being will ever feel again. What's it like to be shot at? It's a nightmare no amount of drugs, no amount of therapy and no amount of drunk talks with your war veteran buddies will ever be able to escape. Cheers boys." That’s only three of the stories out of 58 people whose lives were taken, and there are many stories that are yet to be heard. I didn’t list all of them, because then we would have a novel. Some victims were mothers, others fathers, and sons, and daughters. They were policemen/women, veterans, firefighters, students, lawyers, musicians, artist, lovers, and idealists. Even if you don’t know them, you can already tell they were fantastic people. Even if you don’t know them, hold them and their family/friends close to your heart. I’m sure we all know what it’s like to lose someone you love or someone who is close to you. Las Vegas, hang in there. We're keeping you in our thoughts. On Sunday night, disaster struck in Las Vegas. Shots fired from the 32nd floor of Mandalay Bay hotel to the Route 91 Harvest Festival across the street. 50+ dead and with the death toll rising, it has become what we now know as the most deadly shooting in United States history. The gunman was 64 year old Stephen Paddock, who checked into the Mandalay Bay hotel on September 28th. He was found dead in his room along with at least 10 guns. Paddock was a local resident in Mesquite, NA, which is about 80 miles northeast of where the shooting happened. Police said Paddock has only a routine traffic violation with no other criminal record, and it’s unclear if he has ties with any terrorist group. The suspect’s motive is unclear. “You could see people getting shot,” Gail Davis told CNN. She was in the crowd at the time of the shooting, “I’ve never been that scared in my life.” More than 22,000 people attended the event, according to a report by the New York Times, and over 500 of them were injured in the shooting. This incident is still an ongoing investigation. Our hearts go out to the families of the victims.